If I had to pick two of my favorite things to make, it would be my pumpkin chocolate chip cake and these sugar cookies. I’ve always loved a decorated sugar cookie, though I’ve honed my craft over the years. Back in the day, I’d get impatient and just drip icing everywhere, turning a traditional Christmas tree into some kind of questionably modern art affair. I have great memories of making these at the kitchen table in Virginia (as seen below) with a lot of hilarity and possibly icing fights. Definitely icing consumption. After all the experimenting, this is the best sugar cookie recipe I’ve found. When I moved to Texas, these cookies kept the red and green, but trees were replaced with cactus, and 10-gallon hats, boots, and hot peppers all joined the mix. Plus the state of Texas, of course. 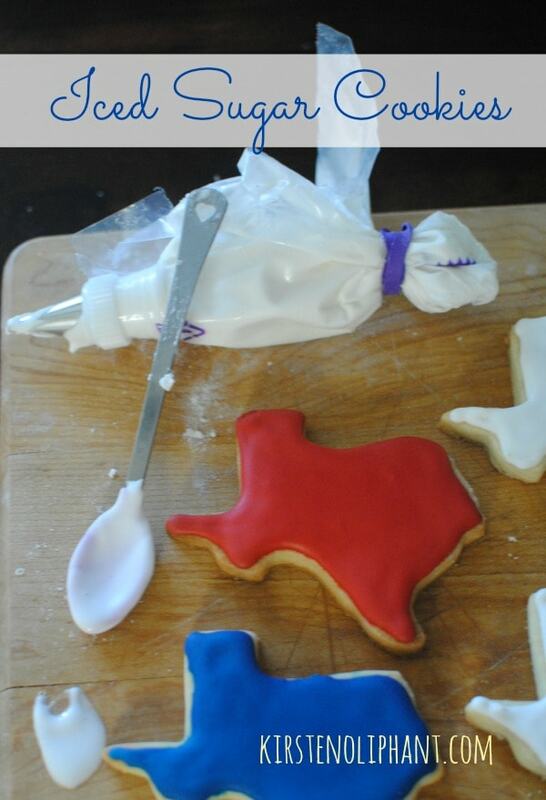 Texas-themed sugar cookies became my gift of choice, especially during the lean years when these were about the best gift we could give. This recipe (which is based on an older Paula Deen recipe) is the best I’ve ever used. Almond extract, though not required if you don’t like it, adds a little oomph. Plus they are lacking the slightly bitter taste of cookies made with cream of tartar. They are also super easy to work with, and I’ve worked with some wicked-hard doughs before. 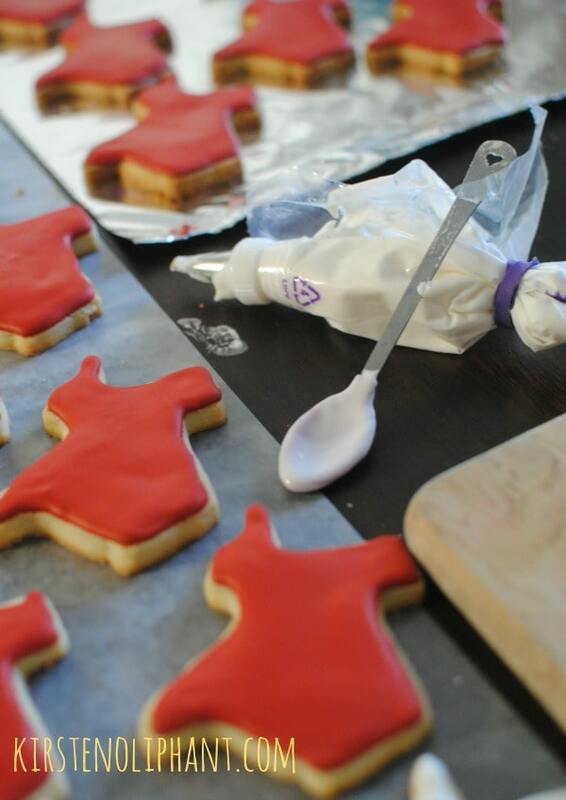 Cutting out cookies shouldn’t be a battle. With a mixer, cream together the sugar and the butter, then add the egg and extracts. Beat until well blended. With a wooden spoon, work the flour (with the salt added) into the wet ingredients until incorporated. Cover and chill at least 30 minutes. Heat oven to 350 degrees. Using flour to cover your workspace, roll the dough out to an even thickness. I like mine thick, maybe a little more than 1/4 of an inch. Place them on a greased pan and bake for 10-12 minutes or until the edges are just starting to brown. Remove and cool completely. With a mixer, begin to slowly add water to the sugar, extracts and meringue powder, beating on high until it begins to thicken. ADD WATER SLOWLY. I usually only use 1/2 cup water, but use more if you'd prefer a thinner consistency. Beat at least three minutes on high before using. When I ice, I typically start with a really thick icing and then use that for an outer line and add tiny drops of water to thin it out a tiny bit as I'm filling or flooding the inside of the lines. The almond extract is totally optional, but makes these amazing! In a pinch or if you don't need the icing really hard, omit the meringue powder (it isn't cheap!) and make the icing thicker (using less water) and give the cookies more drying time. It won't be as hard, but will be cheaper and taste the same. As far as icing, there are many royal icing recipes out there. I actually didn’t know until last year that this was called royal icing. I think the icing that went with this original recipe wasn’t truly royal, with only milk, powdered sugar, vanilla and almond. Now, if I’m doing a paid order, I’ll use meringue powder or Just Whites egg white powder to help the icing set up. (Meringue powder is pricey and can be found in the wedding section of Walmart or Joann’s fabric, or on Amazon. Just Whites are in a can with a plastic lid—think mini coffee container—in the baking aisle.) If I’m making them for friends, family, or as gifts, often I’ll use less or no meringue powder. The icing still sets up, though it takes longer and doesn’t get quite as hard, but is a much cheaper option. I first started out using those cheap, plastic watercolor brushes and would flood the cookies, starting on the inside and working my way out. If I left just enough space between my icing and the edge of the cookie, it would fill in a little without running over. (Icing consistency is also key!) The first time I tried the outline the cookie and then flood it with icing, I hated it. They were much uglier than my old cookies: messy, bumpy, and just not as smooth. After experimenting with my friend Sara Townsend’s tutorial and this post from the Pioneer Woman, I realized that I needed my own method. I make a fairly thick icing and use a piping bag and medium/thin point to outline. Rather than letting that dry, I’ll immediately fill the inside of the cookie, using a baby food spoon and my old method of starting in the middle and pushing to the outside. For me, this creates the smoothness I used to love, but gives an extra protection against drips. Doing it while the outline is still wet also allows me to sort of blend the edge and inside. To make the flooding part easier, I will add a few drops of water to the icing in the bowl. Subscribe for more great content in a once-weekly email! 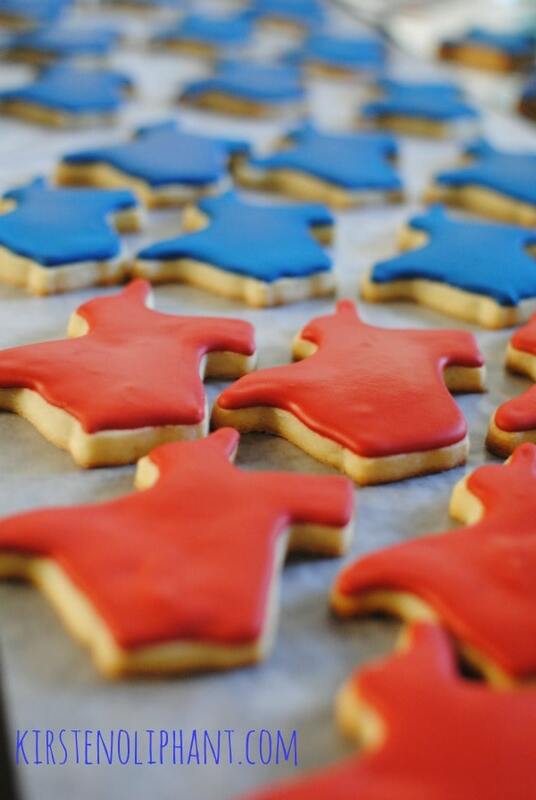 Do you have a favorite sugar cookie recipe or icing style that works for you? Share in the comments! I’m linking up again with Meal Planning Magic‘s 12 Weeks of Christmas Treats. The 12 Weeks are almost over! Do you have great ideas for gifts yet?? I know I do. The Pinterest board is also pretty stellar if you need a lot of tasty in one place. I might be TOO excited over this post. You’re awesome. In lotsa ways Kikster. Thanks for this. You say you’re not a baking guru, but you make some of the most amazing looking food stuffs. You’ve made this sugar cookie baking trial a lot easier than it would’ve been doing it by myself. Yay! I’m so glad. I really love this recipe and would never trade it. Definitely base the icing more on the consistency you want than the exact measurements. Use them as a guide and then get it how you like it!